Will Morris understands, in a way that many in business people seem not to, that there is a crisis of trust in 21st Century capitalism that is deeply threatening to it. 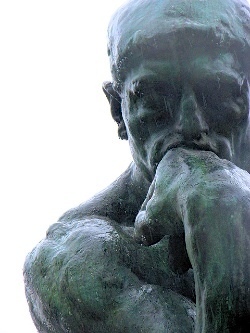 In his view, the root cause is that there has been not so much a collapse in business ethics as a complete absence of a coherent ethical system in the first place. He attributes this to two factors. Firstly, the subtle but extraordinarily significant switch in emphasis from Adam Smith’s focus on “utility” in business dealings (which allowed a broad set of questions to be asked about the relative benefits to not only the parties directly involved in a business transaction but to society as a whole as well) to one of profit maximisation above all. Secondly, he cites the impact of globalisation which, although greatly beneficial in many respects, nonetheless dissolved the often local bonds of trust between individuals – for whom “my word is my bond” meant something real and personal. Of course, if these proposals were to be put into practice, there would doubtless be organisations cynical enough to comply by way of little more than window-dressing. However, the rise of social media would surely make such an approach highly risky. As David Jones has shown in Who Cares Wins, companies that behave like this are already receiving a reputational drubbing at the hands of an increasingly vocal public. What’s more, the publication of ethical codes would provide a moment at which the watchful public could play a very useful role in drawing attention to any shortcomings and so begin a process of helping to make companies more responsive and accountable to their customers and users. There is much else of interest in this paper including a thoughtful reflection on how the author balances the requirement to ask the difficult “why?” questions with that of serving his company’s interests in the highly contested field of corporate tax policy. Will Morris is also an Anglican priest and he has much of interest to say about how Christian ethics can usefully inform secular approaches to a more socially responsible business culture. However, the real value of the paper lies in his proposed legal requirement for companies to publish and report on their ethical codes. It’s a good idea and deserves much more attention than it has enjoyed thus far. I‘m not holding my breath. 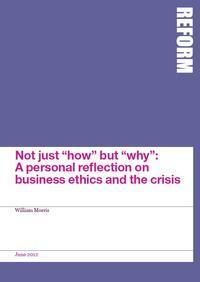 Not just “how” but “why”: A personal reflection on business ethics and the crisis by Will Morris.